In a grim cyberpunk future, a group of sword-wielding warriors traverses the neon-lit city in search of...Murphy's Irish Stout? If you were in the UK during the late 1990s, chances are that you're already familiar with the one-minute short film "Last Orders," an anime commercial for Murphy's Irish Stout. For the rest of us, this gem is what happens when the anime studio Production I.G gets into the business of advertising. A British ad agency approached the Ghost in the Shell and Patlabor studio about creating a commercial for Murphy's Irish Stout. Ghost in the Shell had just been released in the UK, and the agency was hoping to cash in on the rising popularity of Japanese animation. The talent behind the commercial is impressive: Blood: The Last Vampire's Hiroyuki Kitakubo served as director; animation and character design were helmed by Kazuchika Kise of Ghost in the Shell, Blood, and Vampire Hunter D: Bloodlust; and Hiromasa Ogura of Ghost in the Shell and FLCL handled art direction. 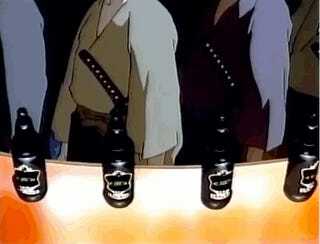 The result is these future-dwelling samurai enjoying an Irish beer.